Looking to invest in a new washing machine? Or perhaps you're thinking washer dryer this time? Or maybe you want a new tumble dryer instead? Whatever your laundry needs, read this guide first: it's packed with advice and tips about buying a washing machine. Whether you're buying a washing machine for the first time or need to replace your old one and are bamboozled by the advances in technology, this guide is for you. And once you're done, you can use our buying guides to find the best washing machine. Don't miss our guide on how to do laundry, too. Looking for more advice on choosing appliances? Use our guide to buy the best kitchen and home appliances. Which washing machine type to choose? Freestanding washing machines are an ideal choice for utility rooms or unfitted kitchens where appliances are on show, or if you are renting. These washing machines generally fit into a classic W60cm base unit space, and you can take them with you when you move since they're classed as unfitted. Integrated washing machines are designed for fully fitted kitchens with appliances hidden behind cabinet doors for a neat, streamlined look, making them a popular choice for open plan kitchen diners or if you are planning a kitchen extension. Usually, you'd leave an integrated washing machine behind when you move house. Slim-depth washing machines take up less room than classic washing machines and are ideal for a small kitchen or small utility room. Advanced stain removal that can target the most common of stubborn stains, from red wine to grass, saving you the trouble of pre-wash treatments or special detergents. Auto dosing is a feature that allows you to pre-fill the machine with enough washing liquid to last about 20 washes; the programme will then release the correct amount of liquid for that particular load. This feature cuts down on unnecessary rinsing, saving energy in the process. Energy efficiency is important for saving on fuel bills, so pick a machine that has anything from an A to A+++ rating; this rating is based on both spin efficiency and wash performance. Bear in mind that the more energy efficient features it has, the more expensive it's likely to be. These features might include variable temperature control, sensors that decide the rinse cycle's length and how much detergent the load needs. LED lighting within the drum to ensure you never lose that single sock again. Load size is down to the size of the drum. If you're washing for a large family, a 9kg washing machine will suit; 8kg will do for an average family; 6kg to 7kg is big enough for single people or couples. Quiet mark washing machines are a good option if you are designing an open-plan kitchen diner and living space or perhaps live in a small home and want quiet appliances. Look out for washing machines with a sound level of around 48dB during washing and 72dB during spinning. Smart washing machines can be controlled from an app on a phone. With these apps, you have remote control of your washing machine, can access washing advice and online shopping to automatically re-order your detergents hassle free. Meanwhile, the machine will inform you of progress wherever you are. Spin speeds vary: more expensive models have an economical long spin cycle for cottons and an interval spin to reduce creasing in synthetics; those combined with a tumble dryer need a high spin speed to dry clothes efficiently. Wash programmes include: economy settings which automatically reduce the water temperature; extra rinse, handy in areas with soft water or for anyone with sensitive skin; hand-wash for wools or silk (claimed to be better than hand washing); quick wash, usually around 15 minutes long (but be aware that this is not an eco-friendly setting); reload, which lets you add to the load once the cycle has started; steam, which revives creased, dry clothes and removes odours without washing; variable temperature control – allowing you to choose a lower wash temperature to save energy. Find the best laundry room storage ideas. Our buyer's guide brings you the best washing machines you can buy right now and, using our comparison tool, at the best prices. Which tumble dryer: vented, condensing or washer dryer? Vented tumble dryers discharge the damp air produced by the drying process via a vent in an outside wall – or, less ideally, via a hose pushed though an open window or door. These models tend to be cheaper than condensing dryers. Condensing tumble dryers discharge the water extracted in the drying process into a container within the machine. This gives you the freedom to install it along any wall, although the room should be well-ventilated to cope with the moist air produced. 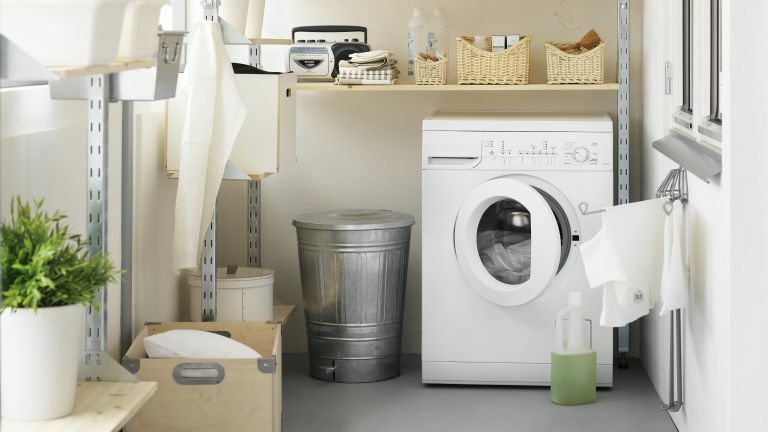 Washer dryers are a good compromise if you have no space but great need for both a washing machine and a tumble dryer. Washer dryers have wet condenser systems that use cold water for the drying process. Although a washer dryer may add to your water and energy consumption, they come equipped with timers or sensors. Some brands also feature a heat pump, which recycles heat in the drum. How to choose the best tumble dryer for you? Crease care – clothes are tumbled every now and then once the drying cycle is finished. This stops them becoming creased if you don't empty the machine immediately. Cool air setting – refreshes clothes that have been stored. Ideal if you put out-of-season clothes away and want to wear them without washing, ironing or dry cleaning them. Drum capacity – the bigger the drum, the faster the drying time, the fewer the creases. Tumble dryers tend to dry a similar-sized load to that of a washing machine with the same size drum; they tend to be available in 4kg to 6kg, 7kg to 8kg, and 9kg models (1kg would roughly equate to one person's dirty clothes for a day). Energy efficiency contributes greatly to running costs (as does the time the machine is left running and how full you've loaded it). Since tumble dryers cost more to run than washing machines, it makes sense to invest in an A-rated one: heat pump condenser models or ones with sensor drying (see below) being the most energy efficient). Final cool tumble takes place in the last 10 minutes of the drying cycle, bring clothes back to room temperature. Heat pump technology, available in condensing tumble dryers and some washer dryers, helps contribute to an A energy rating; the hot air produced in the drying process is reused, making the it much more efficient. Reverse tumble is where the drum rotates first in one direction, then the other (and so on), separating clothes more efficiently and therefore speeding up the drying process. Sensor drying is when the tumble dryer notes that your clothes are dry and stops – a good energy efficiency feature. Use our comparison tool to find the best priced tumble dryer from our pick of the best tumble dryers on the market.